Whew! It is so hot here today. I don’t have the air conditioner installed in my bedroom yet, and I probably would have been fine for the night, but the dog woke me up in the middle of the night panting as if he had just run a mile. I had to get up and hunt down a fan for him, but I’m going to hold off on installing the air conditioner since temperatures are supposed to drop dramatically over the weekend, which is fine with me. I thought today’s post would be a celebration of my first quilting design wall. Sure, it wasn’t much to look at last night when I attached the $2 vinyl backed tablecloth to the wall. I couldn’t use thumb tacks to put up the tablecloth because the plaster seems to be made out of steel and titanium on that wall, so I settled for painter’s tape. That was a terrible idea. The whole “design wall” fell down in the middle of the night and scattered the blocks that I had arranged to my satisfaction. So, now, the table cloth is draped across my dining room table, and I’m brainstorming a new location for a design wall. 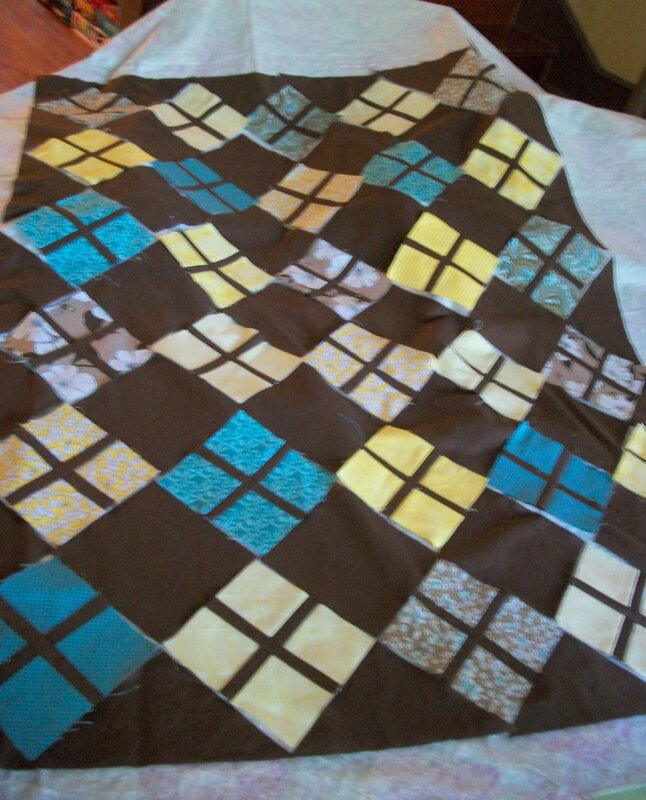 Meanwhile, I am happy with how my Daisy Baby quilt is shaping up. I want to get some piecing of it done tonight while listening to Heat Wave. Yes, I gave into the morbid curiosity to listen to the book spawned by the TV show Castle. It’s doubtful I’ll get far on the quilt tonight since today I went to a gigantic library book sale. I told myself not to go this year. I told myself to just read the books I have on my shelves and in my Kindle. Then, I told myself to just go and look for quilting books and some books from the The Cat Who mystery series. I swear though that if thousands of books are gathered at half price, they act as a magnetic force on some strange part of my being. Four hours later after scouring about 15% of the riches of the book sale, I emerged with an uber heavy box of books. Yes, there are some Cat Who books and some quilting books in there. But, guess what else? I found a comprehensive chronology of Agatha Christie books. Woo hoo! I had just been thinking this morning that I needed to print a fresh list of her books off the computer because mine is all marked up (and I didn’t have it with me this morning, so I hope I didn’t pass up the last few books that I need to complete my collection). The chronology is probably more trustworthy than the Wikipedia one, and it offers some interesting tidbits and plot synopses (perfect for me since I always forget what the books are about and could use a memory prod at times). The woman checking me out says she owns all but two Agatha Christie books — ones that were published in England. And, she told me to read the Cat Who books in order because they are funnier that way, which is my plan. Ah…books sales. It’s where kindred spirits meet. I actually took the plunge and put my name on the volunteer list. The book sale always happens right after the semester ends, so I’m not 100% sure I’ll be able to participate, but volunteering would probably let me bump shoulders with some interesting people. While there, I “splurged” and bought The Other Wes Moore: One Name, Two Fates for $2.50 since it was on my book wish list. Now I’m trying to decide whether to start it or an Agatha Christie novel next. First I have to finish Kristen Lavransdatter: The Wreath before it becomes one of those books that languishes with the last chapter or two left unread. I also “splurged” $2 for Advertising in America: The First 200 Years because I’m a little bit of a sucker for coffee table books even if I don’t have a coffee table. Do you know what I think would be fun? It would be amazing to not have to make any money while running a used bookstore (so I wouldn’t have to worry about online retailers squashing me). And, in this little bookstore, I would curate a section of coffee table books for $10 or less just because it would be so stinkin’ fun to gather them. Maybe I’d even refinish and sell coffee tables. And, maybe I’d also see how many complete Agatha Christie sets I could collect and sell. First, I should get my life organized by reading Organizing for the Creative Person, one of my 25 cent steals. I hope if my sister is reading this, she is proud. I struggle in the organization category. Maybe it’s because I’ve been trying to learn organization from non-creative people. Who knows? My sister probably would just tell me though that organizing would be easier if I’d just stop bringing books home. But, I’m going to try to distribute batch one to appropriate locations right now. Then, I can bring in batch two from the car after I mow the lawn. Where has the day gone?